We have several different vendors, with many options to choose from to meet your outdoor kitchen needs. This includes all outdoor appliances, fire tables, fire pits and fire places. Key Landscape and Irrigation has the resources to install professionally designed outdoor kitchens & BBQs. We have built numerous kitchens for homeowners throughout New Hampshire, and they are completely satisfied with our custom kitchen setups. Outdoor kitchens can take your cooking and entertaining to a whole new level. If you simply want to improve the functionality of your home but ran out of options, the addition of an outdoor kitchen is the best solution. Please call us at (603) 352-6496 and let us discuss this great outdoor feature. 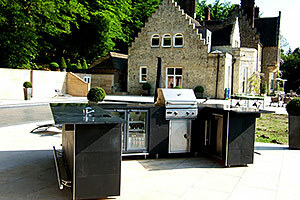 As a reputable contractor, we will make sure that you’ll get excellently designed outdoor kitchens & BBQs. We can create this kind of setup through careful planning and discussion with our clients. We will recommend tips and come up with a sample design proposal for your approval. We also consider the state’s weather conditions when working on outdoor kitchen designs. The installation commences once you are satisfied with the design plan and agreed on the cost of the entire project. The installation work will be handled by expert builders and experienced crews, so quality workmanship is guaranteed. Installing an outdoor kitchen and BBQ is a surefire way to jazz up your backyard and create an interesting outdoor living space. And to make an outdoor grill and kitchen work, you need top-quality outdoor kitchen products and appliances. Our company only installs top-notch branded kitchen appliances and use quality construction materials. We can recommend a range of weatherproof appliances, which can significantly enhance your outdoor cooking experience. 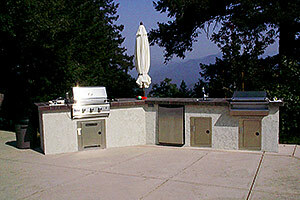 If you can’t decide what kind of amenities or appliances to include in your outdoor kitchens & BBQ’s, just let us know. We will help you choose the perfect kitchen appliances and features for your dream kitchen. Our elaborate kitchen designs are packed with countertops, sinks, fridges, cabinetry, and cookware, all of which can make your outdoor space stunning. Meanwhile, smaller kitchen setups can include a grill for fun BBQs and a comfortable dining setting. These days, outdoor kitchens & BBQs do not just revolve around a grill. There are many factors you need to consider to get a fully functional kitchen setup. You can go for contemporary cooking spaces with canopy outdoor lighting to rustic and vintage kitchens with rotisserie burners. If you and your family grill often and enjoy dining alfresco, then the best features to add in your backyard are outdoor kitchens & BBQs.